Do your kids know that David lived 1,000 years before Jesus? Do they know that he was King of Israel for 40 years? Do they know he wrote lots of Psalms, played the lyre, and his son Solomon built the Temple? Kids usually know David killed Goliath...but the other facts tend to escape them. Over the years, we've come to realize that most kids have big gaps in their knowledge when it comes to important Bible Heroes. That’s WHY we designed our Bible Hero Fact File Printables. Each one-page worksheet does a “deep dive” into one prominent Bible figure. On each page, kids are asked to look-up answers to 8 questions in their Bibles. A timeline appears at the top of each “Fact File” which helps give kids an big picture understanding of time & place for each Bible figure. Each puzzle will reveal a famous Bible saying by or about the hero. Inside you will find 22 Bible Hero Fact File Printables- just like the one above! You can print off as many copies as you need for your own church or private use. 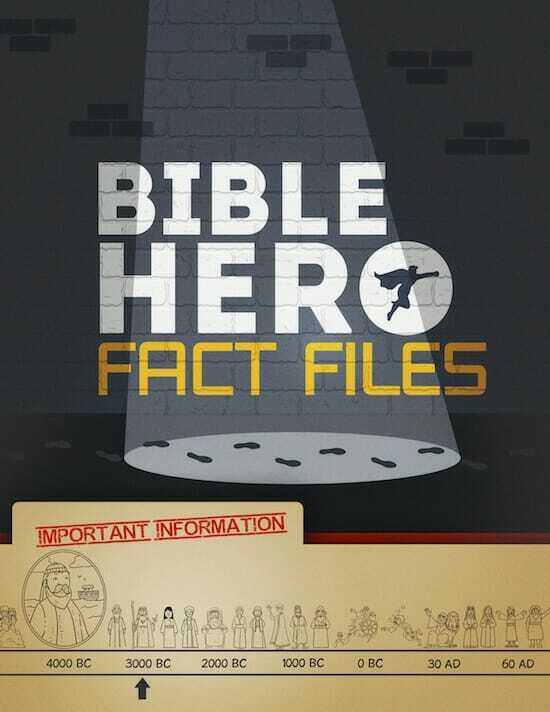 As soon as your order is securely processed, we’ll direct you to a download area, where you can get instant access to all 22 Bible Hero Fact Files Printables. Kids find these sheets an enjoyable challenge, and love discovering new information to help round out the Bible Hero in their mind! We are so sure that you will love the Bible Hero Fact Files that we are offering an unconditional 100% money-back guarantee. Bible Hero Fact Files that I can use over and over again.